My Form width its 239px and when i add the option off "address" from the quick tool its crossing the form width (cant shrink it). i have limited space for the width and i must to put the form in this size . 1. I want to know please how can i adjust the width size also height if it's possible ? 2. I want tio know also if there is an option to delete from the quick too "address" the "Country" option since it's only for USA. ? 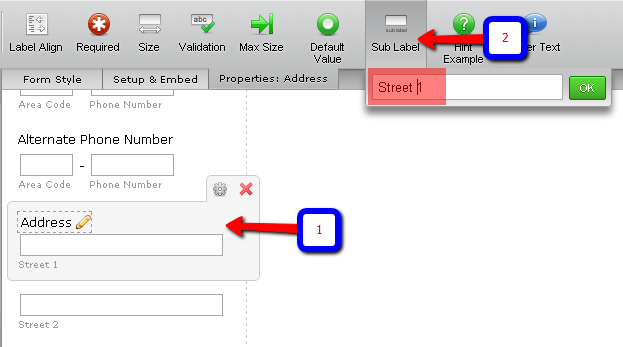 You can actually create address boxes using normal text boxes and shrink them to align the boxes on the same line. After that, add sub labels. Please check this sample form. You can also clone this form if you like. Hope this helps. Let me know if you need any further assistance. Thanks! In addition to my colleague's answer. You can also inject this custom CSS into your form.